Copyright Information: Please discuss with an archivist in the Louisiana Division. The Works Progress Administration (WPA) was established by executive order of Franklin Delano Roosevelt on May 6, 1935. It replaced the Federal Emergency Relief Administration (FERA) as the federal government agency responsible for combatting the ill effects of the Great Depression. The WPA was a work relief program and it was instrumental in providing jobs for many individuals who had become unemployed during the nation's economic downturn. Most WPA projects were carried out by local and state governments using funds provided by Washington. Several projects were administered directly by the federal government, including the Art, Music, Theatre, and Writers' projects. The bulk of WPA spending went toward the construction and maintenance of the nation's infrastructure. Smaller amounts funded educations, recreational, and cultural activities. In Louisiana, state headquarters of the WPA was located in New Orleans. The agency also operated district offices around the state. 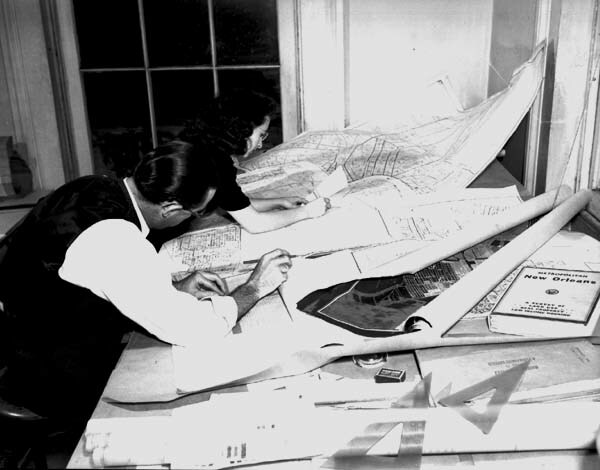 In 1939 the program's name was changed to Work Projects Administration. On December 4, 1942, the president ordered an end to WPA activities as the nation's war effort eliminated most of the unemployment that the agency had been designed to combat. 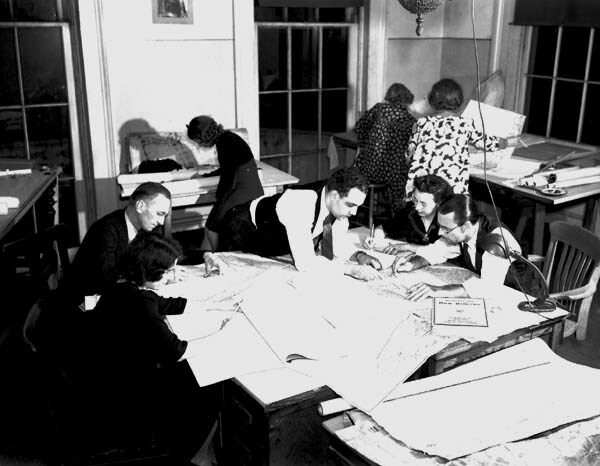 WPA projects in the Crescent City ranged from street paving and bridge building to bookbinding and adult education. A considerable amount of the agency's varied activities in New Orleans and throughout the state was documented by WPA photographers. This collection is the product of their work. For additional information on the WPA in New Orleans and Louisiana, see microfilm series M1367, Selected Documents from the Louisiana Section of the Works Projects Administration, General Correspondence File ("State Series"), 1935-1942. A description of those records is available in a pamphlet at the Louisiana Division reference desk. For more online information on the WPA and other New Deal agencies, see the New Deal Network web site. The main collection comprises ca. 7000 4" x 5" negatives recording the work of various WPA projects in New Orleans. Approximately 10% have contact prints attached to the negative envelopes. Many of the photographs are identified by project, place, and date through notes on the negative envelopes. 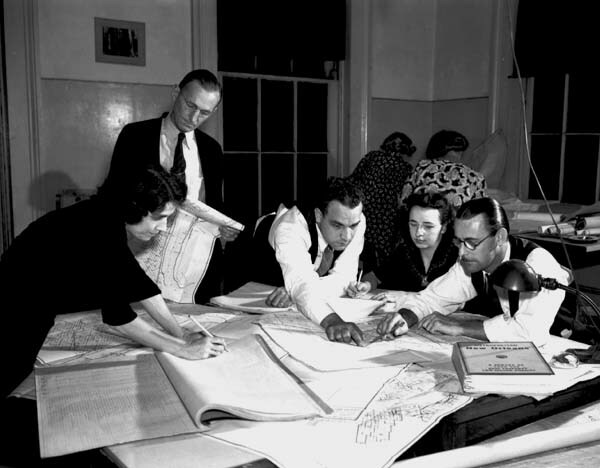 Among the projects represented: art, archives, drainage, education, the lakefront, the U.S. Naval Air Base, nursing, City and Audubon Parks, paving, and public buildings. Also included are 3 cu. ft. of 8" x 10" prints. Most were probably made from the negatives described above, but there are also a number of prints for various projects outside the city limits. Of special interest are several prints showing President Franklin Roosevelt during his visit to the Crescent City in 1937. Related to the WPA Photograph Collection is a scrapbook with photographs showing various activities of the National Youth Administration around the state during 1938. The negatives are arranged into series based on the WPA projects as identified on the wrappers in which they originally were housed. Each project is divided into series, again based on the original identifications provided (some projects have only one series). Project/series descriptions, also based on the original identifications, along with dates, project dates and numbers (where indicated), and the number of negatives in each series are listed in a series of tables. Each series description also includes reference to the individual negatives (by negative number) that are accompanied by contact prints. Information on 8x10 prints will be added as it becomes available. Information on, and links to, digital versions of the photographs will also be added to the tables as scanning of the collection progresses. The table for the first series appears below. 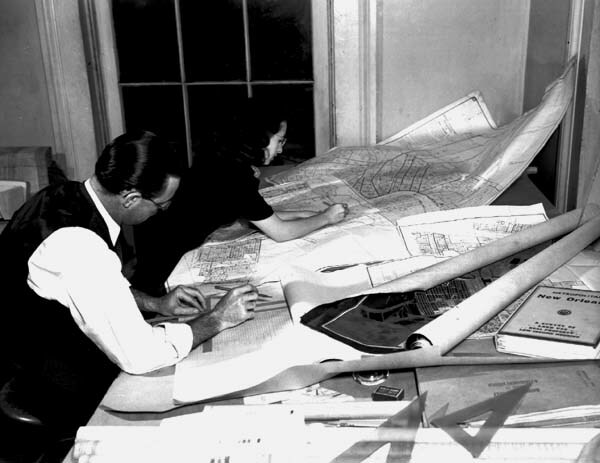 Working against time, these WPA researchers and map makers in the city planning and zoning commission are preparing New Orleans' air raid warning map. The basic material used in preparing the map is the real property survey of the city, compiled by WPA workers two years ago, as well as zoning, traffic and delinquent tax surveys previously made by other WPA projects. Listed below are the projects included in the collection. Click on an individual project name to retrieve the table of descriptions for that project. A number of volunteers have assisted with the scanning of these images. The project was completed in the Summer of 2007 by volunteer Siobhan McKiernan Flahive. Our thanks to everyone who has worked on the project over the last 8 years.